Written by Andrew Cen of the HCI Games Group. This post was not endorsed in any way by anyone but the author. Image taken from: Games User Research edited by Anders Drachen, Pejman Mirza-Babei, and Lennart E. Nacke. This blog post was NOT endorsed by the editors or authors of the Games User Research book. The following is the personal opinion of Andrew Cen, SWaGUR student in the HCI Games Group. It is, in my opinion, seriously a great text if you are starting your journey to learning about user experience and research. A lot of the concepts pertain and exist outside of the world of games and can be applicable in other applications of UX/UI design and research. The chapter I am reviewing speaks to understanding an entity’s involvement with UX research, and can be found in chapter 5 of Games User Research. The author of this chapter is Graham McAllister, the founder, and director of an award-winning play-testing studio, called Player Research, based in the UK. Just why is it important to understand where your company, team, or yourself stands within the spectrum of UX maturity levels? Often times many entities can believe they are engaging in particular processes, or aspect of an industry, simply by having employees hired into that field. This method of measuring engagement is immature and doesn’t offer any explanations into the processes that this sector, any sector, took. In UX, “if [a studio were] really committed to putting the player experience first, it is useful to have a roadmap of what good user research actually looks like and how to get there” (McAllister 62). A roadmap can be a useful tool into understanding where you are currently and provide tools, processes, or information into how you can improve within that aspect. I have selected an excerpt from Graham McAllister’s chapter in Games User Research, to emphasize why you should care about your UX maturity level. You want to improve the quality of games coming from the studio. You want to produce more successful games repeatedly (not just a one-off). You want to become a better designer (by understanding players better). The most successful studios tend to have more mature UX; what are they doing? You want to understand what to do next to become more player-focused. Beginning with the broad categories that UX maturity levels can fall under, we can look at levels 0–3 and 4–7. From levels 0–3 we can expect that “your UX efforts could either be having no beneficial effect on your game or potentially even making it worse[,]” and from levels 4–7 we can expect that “UX resources available are sufficient to reliably improve the player experience” (McAllister 63). These two broad categories allow us to know which end of the spectrum we sit on. We can ask ourselves two simple questions to figure out if we are in the higher or lower spectrum of UX maturity: Do you know about UX research and testing, and have UX methods helped your game in any quantifiable way? If your answers to any of these questions were no, then you most likely fall into the lower category of UX maturity level. If you fall into the lower category of UX maturity level, then you have your work cut out for you. One of the first steps you can take is to ask yourself: how do I incorporate UX research into what I am doing, and how can I use UX research design to improve my current users experience? For a more detailed list of what you can consider doing within each level, please refer to the chapter 5 in Games User Research. Now if you fall within the higher category you should not be resting just yet. From level 4–7 is a range of hoops and loops, you’ll have to jump through before you get to the end. Each variable you have to consider for the UX maturity level will, at these stages, require more time and investment. Unless, of course, we’re talking about level 5 which is where you outsource your UX research, at which point it’s based on monetary investment, time frame, and management decisions. Now my goal here is not to give you a summary of the chapter, nor is it to provide you detailed tools to improving your UX maturity level, but to provide you with information that could encourage you to further your research into such topic matters. Even if you have reached the pinnacle of UX maturity level at 7, it does not mean you can stop growing: UX research and design is changing and adapting differently every day, as user needs change too. As UX researchers we must strive to adapt our processes and continue to evolve and grow with society. I firmly believe the place to start is with you, “the user”. McAllister, Graham. 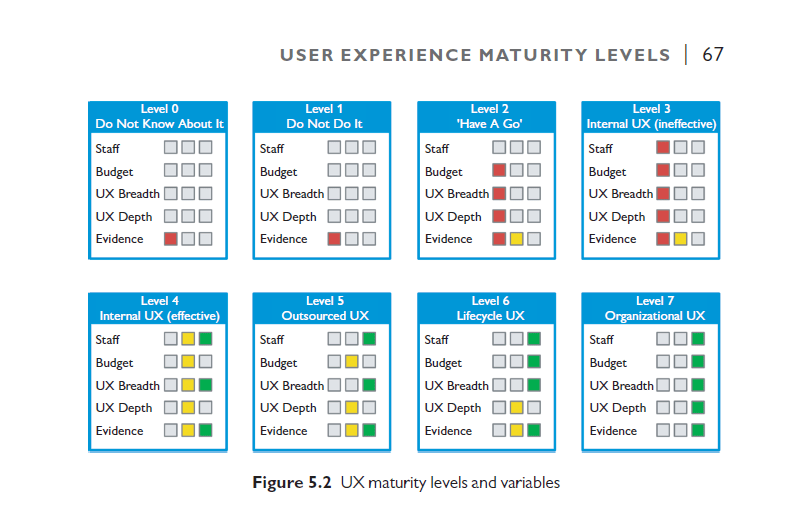 “User Experience Maturity Levels”. Games User Research, edited and introduction by Anders Drachen, Pejman Mirza-Babei, and Lennart E. Nacke. Oxford University Press, February 5th 2018. Removed and corrected a reference to a non-existing endorsement.